I’m sure a lot of people have heard about the typhoon that blew in today. You can read an article all about it here. It didn’t really seem to have too much of an impact on people, with the exception that the Athlete’s Village was packed since training was suspended at the venue. That left a whole lot of riders and support staff looking for something to do. And the malls were closed! It also meant that some of the jumper horses that were due to arrive today are delayed. The Americans are still stuck in Aachen and the Australians are having to make a prolonged pit stop in Dubai. Hopefully the weather will clear soon and they will be in before the week is over. By late afternoon they re-opened the venue for training, which saw a mass exodus from the village to the stables. Mike and I had a Team Leader meeting at 7pm so we headed over there later. I was curious to see what the footing would look like after the torrential downpours and gale force winds we had today. When I arrived, the rings were full including the main competition ring. I was absolutely amazed to see the footing look like it hadn’t seen a drop of rain all day. Wow! It was perfect. Not even a slight damp patch anywhere to be seen. Now that is impressive. Ashley and Leslie had their horses out in one of the side rings which was booked for Canada. Both horses looked relaxed. 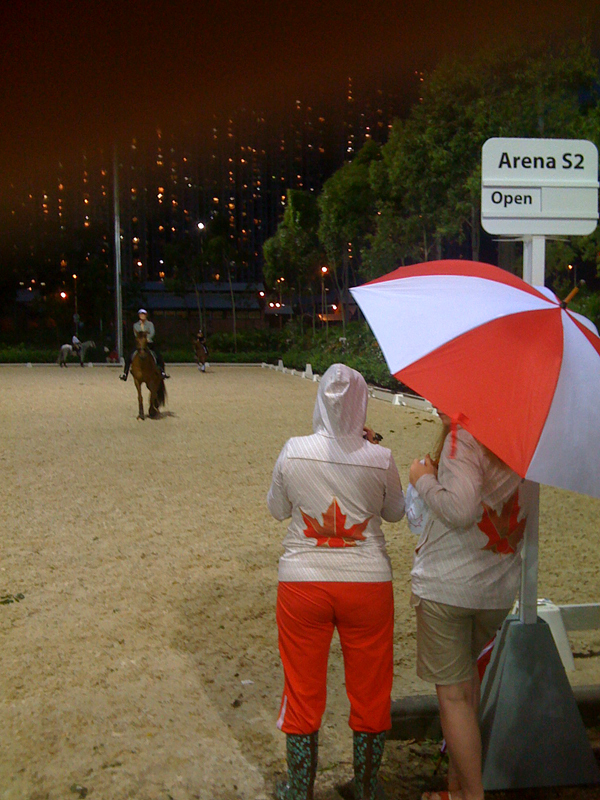 The Canadian Eventers had some time booked in the main competition arena where there were jumps set up. Each country had a set time limit to use the arena. They could jump the course, jump a few jumps, or just work around the jumps. Everyone seemed relaxed in there too, even with the big jumbotron all lit up showing videos and images. During tonight’s team leader meeting, Germany asked if the jumbotron would be on or off during the competition. 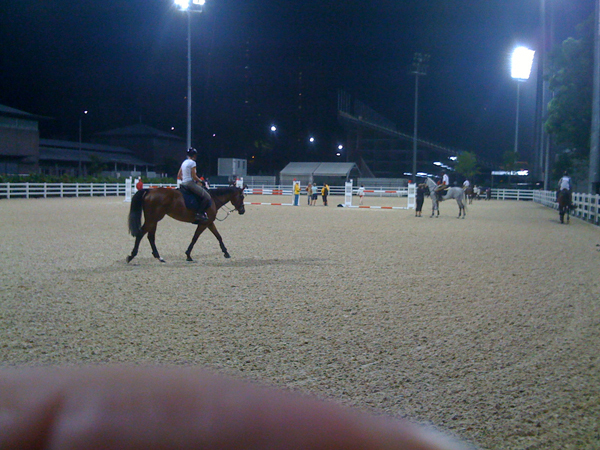 The organizers said that they had it on tonight to see how the event horses would react and depending on the reaction, it may be off during the competition. I had heard of a few horses being less than impressed (to put it mildly) about the jumbotron the previous night so I wouldn’t be surprised if they turn it off completely for competition and maybe only have it on during breaks. Funnily enough, apparently it’s the cartoon horses jumping over jumps and piaffing that caused the biggest upset. That must be one scary cartoon horse! I had a guest pass for the village today and wanted to take full advantage by eating dinner there. Guest passes are from 9am to 9pm, and Mike & I arrived back at the village at 8:50pm. Managed to get through the security check and made a bee-line for the restaurant. Tonight’s delicious menu included roast beef, prawns sauteed in soya sauce and of course my dear ol friend Mr. Blueberry Cheesecake. I ate as quickly as I could but Mike still rec’d a phone call from the security folks downstairs asking where I was (it was 9:15pm by this point). Mike managed to convince them to let me finish my dinner and I was back down in the lobby by 9:30pm. I have a pretty sore stomach from eating so quickly, but it was worth it! When I arrived back at the media hotel, the scene in the lobby was pretty dismal. Buckets everywhere, towels over the computers…..seems the ceiling was leaking in multiple locations. I’m guessing it must be connected with the renovation work that they’re doing on the roof. All I know is that my room is nice & dry and my bed is calling out to me so I’m signing off. Hopefully tomorrow I can tell you about the Jade market! Thanks for the updates! You are so amazing at this! I was worried for a day there but you set my mind at ease! 🙂 Good to hear the horses arrived and everyone survived the typhoon with no problems!! Keep up the good work! Really appreciate your efforts in keeping us updated … it makes as feel as if we are “in” on the behind the scenes of the Olympics. Fantastic. Thanks so much Kerri for keeping us connected ! I am enjoying your posts immensely and will be following all the excitement closely….Best of luck to all our Canadian riders and horses. ps – I am loving your food reports too – wish I could be there to experience it all…yummy !!!!!!!! GO CANADA !!!! So glad everyone survived the Typhoon. What an experience! The more I read your updates the more I appreciate how lucky the Canadian Equine Team is to have duch super volunteers like you & Mike. Nothing seems to phase you two – what a team! You really have the interests of the riders (& grooms) at heart. By the way, they interviewed Ian Millar at the Ottawa Capital Classic Show just before he was leaving for Hong Kong. Have a great ride everyone – we’ll be thinking of you every minute. GO CANADA! Great update. My eyes get so tired reading all of your updates but its deffinatly worth it. Its going to be neat seeing all these horses on TV and knowing we have the inside scoop on whats going on with them from behind the scenes. Its almost like we will be right there at the ingates, barn and warmups with them. Kerri: Thanks so much for the wonderful commentary and pictures. Although I live across the NY border, you have made me a fan of Team Canada ! Many of your eventers compete at our Stuart Horse Trials, and they are favorites of all of us who are staff there. We’ll be rooting for your guys as well as our own. Thanks Kerri, what you are doing is awesome. I feel the excitment building and can’t wait until tomorrow! Pass along good thoughts and best wishes to the Canadian Team, we are behind them 100%!! Kerri, Hands down you have the best blog going on re: the Equestrian scence at HK and I am from the United States! I really appreciate the inside scoops and behind the scences activity that leading up to the big event. I wish the USA would be a little more forthcoming and unfortunately have taken the IOC rules re: blogging literally. 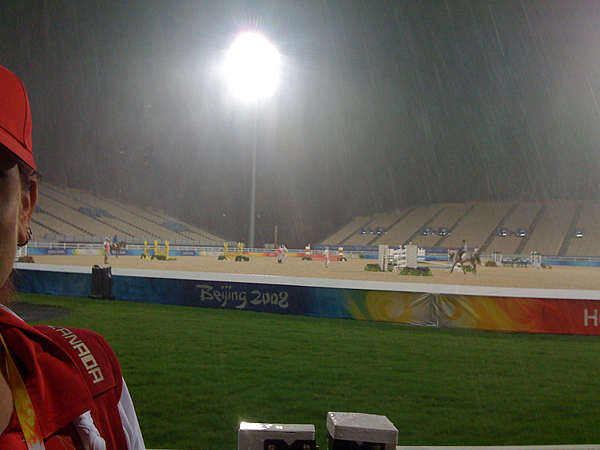 Good luck to Canada….I definitely think the Eventers and Show Jumpers will give everyone a run for their money this year. You are amazing!! You write so clearly I almost felt like I was there with you. I love it, especially the pictures. Keep up the great work and let us know everything, we are anxious for every word. More picture of Kyle Carter wouldn’t hurt either..
Nice thumb Kerri. I know where that is coming from !!!! Are the jammies waterproof? 🙂 Thinking of you back here in TO. FYI I we are having our own version of your Typhoon weather. We don’t dry out as well though. Can I put my order in for some Jade please? Have a blast while you are there and say Hi to Ann W when she gets in. We wore her out last weekend at our show. Kerri your posts are terrific! I can’t wait to read them each day, it’s the first thing I look for when I log on to my computer. Love your ‘dining details’, I’m a foodie too! You go get that cheesecake girlfriend!! You’ve earned it!